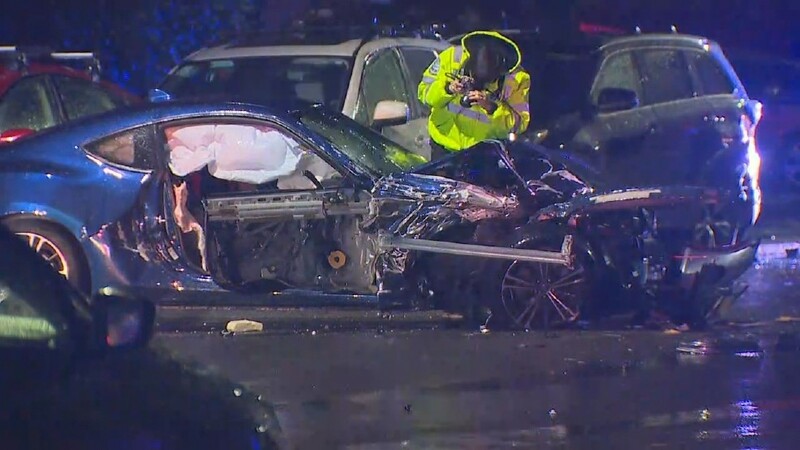 Police were called to the scene of a smash-up that damaged at least seven cars in West Seattle. The incident happened at approximately 8:55 pm on Alki Ave. SW, between 53rd Ave. SW and 54th Place SW. The pile-up began when a driver rear-ended a parked car, causing it to flip over into a yard nearby. That car hit other cars that were parked on the street. One of the parked cars hit turning that time was pushed into the roadway and sideswiped a vehicle in oncoming traffic. Fortunately, most of the cars involved were parked and empty at the time of the crashes. Two people were in the initial car that caused the crash; firefighters evaluated both at the scene, but both refused treatment. One woman who was driving the car that was sideswiped was also evaluated by firefighters. She also refused treatment. The driver of the vehicle that caused the crash was given a field sobriety test. Police had suspicions that he was operating his vehicle under the influence of drugs or alcohol. They took him into custody after the test and are considering filing charges. The female passenger of his vehicle was not taken into custody. Fortunately, no injuries were reported in this crash, so the driver is unlikely to face charges of vehicular assault. However, driving under the influence of drugs, controlled substances, and mind-altering medications is a serious charge under Washington state law. After being taken into custody by police, a search warrant for a blood draw is usually issued and blood is taken at a local hospital. Toxicology tests can take weeks or even months to come back, depending on the potential substances involved and the case load currently being handled by the toxicology lab. The severity of the legal punishment for driving under the influence depends on the circumstances of the case. If the at-fault driver is found to be a repeat offender, their maximum possible fine and jail time rise steeply with each subsequent offense. Courts will also take into account the severity of the damage they caused; a DUI driver found at a sobriety checkpoint may not be punished as harshly as one who’s also facing charges of vehicular assault or vehicular homicide for causing a serious crash. When an accident with a drunk driver only causes property damage, it’s sometimes easier to handle the necessary insurance claims on your own. However, when injuries and high medical expenses are involved, the insurance companies of drunk drivers may try to fight claims or present settlement offers that are unfairly low. In these cases, it’s often beneficial to victims to have an experienced personal injury lawyer on their side.